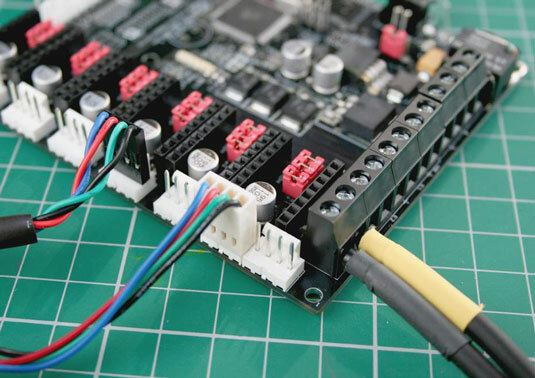 Even with a full, ready-to-build RepRap kit of parts, you will always have to connect various components and devices to the electronics — and sometimes that means crimping connectors or doing a little soldering. One of the easiest connection types is a screw-terminal. 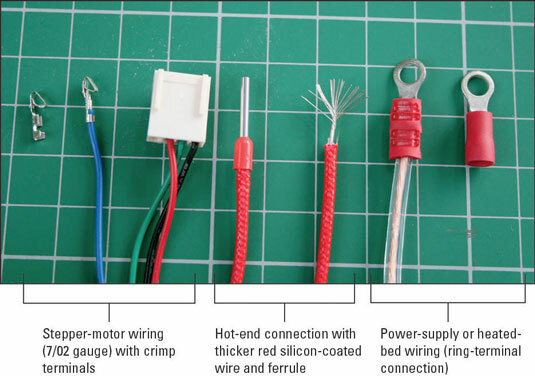 Often used for higher-power connections such as the power supply input, hot-end heater, and heated-bed, the screw-terminal can also be used for motors, fans, and lighting. It’s a very good idea to use bootlace ferrules when attaching wires to screw-terminal connections. The ferrule helps constrain the wires so their strands don’t spread out when the screw is tightened. Ferrules make for a more secure connection and help reduce chances of frayed cable strands, short circuits, and burnt connections. Another common connection is the crimped multi-way terminal; these are inserted into a plastic shell and form a connector that can be plugged into a mating set of pins on the electronics. Multi-way terminals are often keyed so they can only be inserted one way; others use plastic shells that can be accidentally offset on the mating connection. Be careful when attaching any connection — make sure it’s correctly oriented. Many other types of connectors can be used for RepRap electronics, power supplies, and other board modules. When you buy a full RepRap kit, connectors and wiring often come pre-made; check with the supplier if you have any concerns about the wiring of the electronics. Small mistakes can quickly destroy one of the most expensive parts of your new 3D printer. Selecting the correct gauge wiring is also important for safe and reliable operation. A NEMA17 stepper motor, for example, will have 7/02-gauge wires fitted: 7 strands of 0.2mm wire are twisted together to form each cable. This size of wire is usually suitable for connecting sensors, fans, and LED lighting. Connections to hot-ends, heated-beds, and power supplies require significantly higher-rated cable.